The left-slate has won a landslide victory in elections to a key Labour disciplinary body in a fresh boost to Jeremy Corbyn. 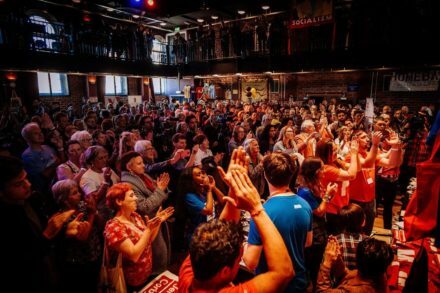 Two candidates backed by Momentum and the Campaign for Labour Party Democracy (CLPD) scored more than double the votes of their centre-left rivals in the contest for the national constitutional committee (NCC). Emina Ibrahim, vice-chair of Momentum and a Unison member, and Anna Dyer, a Glasgow activist, won out over Rose Burley and Kevin Hepworth, who were backed by Labour First and Progress. Burley had been the chair of the 11-member NCC, which decides on disciplinary cases such as that of Ken Livingstone’s comments on Jews. The results will not come as a surprise to members but underline the scale of the left’s dominance, just weeks after Seema Chandwani and Billy Hayes were easily elected to the conference arrangements committee. They will take up their posts next year.